I am excited to share another one of the talented farmers that I get to work with here at The Local Bouquet. Although the season is so short, each year I look forward to the bounty of peonies that will be grown from local farmer Anne Kubik and her partner David Rockermann. 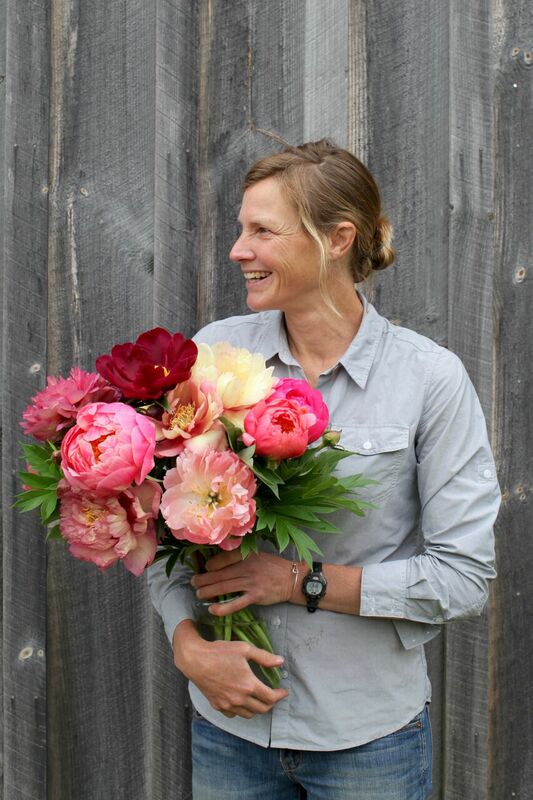 Anne is the co-owner of Electric Moon Peony Farm in Adamsville, Rhode Island. If you've never been to Adamsville, Rhode Island picture a quaint little New England village, just minutes from the river, beaches and local fishing spots. This quiet little village is home to a handful of small businesses and lots of historic homes. Grab your morning cup of coffee and newspaper, walk through the lantern-lined streets past the local baseball field and continue on till you see the most beautiful peony farm, tucked behind an old New England cape and beautiful farm land. Anne Kubik and David Rockermann dug their first beds for Electric Moon Peony Farm in September of 2012. Anne’s 20+ years of professional horticultural experience combined with David’s teaching skills from his 12 years of work as an educator, created a small-scale growing operation where individuals come to enjoy, work and learn within the beauty of the natural world. They have been cultivating peonies and designing and maintaining landscape gardens full-time in Little Compton, RI since the fall of 2013. I met Anne (and David) in 2013 when word spread quickly throughout our little town that a young couple had started a peony farm just minutes down the road from my then-studio location. I was intrigued and knew I had to meet this couple because not only would it be an opportunity to buy one of the most coveted flowers in the wedding industry, but it would be an opportunity to meet other like-minded people who loved and adored flowers just as much as I do! I am so glad that our paths crossed four years ago, because Anne, David and their adorable son Ninan have become part of my family. This couple is the definition of what it means to be stewards of this earth and the land that they live and work on. They inspire me to dive deeper into my craft and my art while educating myself on the horticultural history of the flowers that I am working with. What did you want to be when you were growing up? A gardener. Why flowers? I had been, and still am, working as a landscape gardener. Flowers are familiar friends. If you could only grow one thing for the rest of your life what would it be? Sugar snap peas! The sweetness of a flower for the palate. Favorite season for locally grown flowers? Spring. What is one thing you couldn’t work without? A healthy body. What is one thing you never leave home without? My nippers. If you weren't flower farming anymore, what would you be doing? Gardening. How did you come up with the name of your company? The land on our farm is mostly flat with hills rising up to on the western and southern sides. We grow peonies in this big bowl, and on moonlit nights, we harvest moonlight. What is your favorite thing about your farm? The land. What is your favorite thing to come home to after a long day? Because we grow at home, there is no 'coming home'. There is a magical moment at the end of the day after we've tucked the tools and the wheelbarrows into the barn: we slide the big barn door closed and the yard is ours to play in. What does your day-to-day look like? I get up with Ninan and we play and eat breakfast until it's time to go outside. Then we bundle up, head for the tools and the toys and then to the field. There's a lot of stopping to answer questions and inspect worms. We work until lunch and nap. My partner and I eat lunch together while Ninan sleeps. Then it's play/work, eat, and sleep. Name the biggest overall lesson you’ve learned in running a business? Timeliness with plants and clients. Which of your traits are you most proud of? An eye for detail and an ability to enjoy the extravagant and mundane tasks of growing. Name your greatest success (or something you’re most proud of) in your business experience? People enjoying what we grow. Name a woman or women whom you admire or look up to? Any of those stodgy British gardener/authors. What was the best piece of business advice you were given when you were starting out? Do what you love. What inspires you as an entrepreneur? Yvon Chouinard. What does success mean to you? Spending the majority of my day feeling like I am playing and knowing I am working. You are a mom, like me. How do you balance mom-life and work-life? Ninan is with my partner and me all day. Mom-life and work-life are virtually indivisible. Do you get Ninan involved in the farm and how? Ninan is out there with us pulling weeds and pushing his own wheelbarrow. He has a fleet of dump trucks , tractors,and excavators that find happy work in the soil. What's one thing you want Ninan to take away from seeing his mom work so hard? Work can be fun. What advice do you have for other working mommas? Working with our son presently requires a lot of flexibility. Mostly, this flexibility has to do with my expectations - I have ideas abut how the day will go, about what will get done today and what we can expect to do tomorrow. Working with our child at our sides, slows things down, and somedays it slows things down tremendously. When I feel impatient with what seem to be the day's slownesses, I take in our little one's sweetness and am reminded that his time with us is short then my mind changes to look at what we get to share with this child.